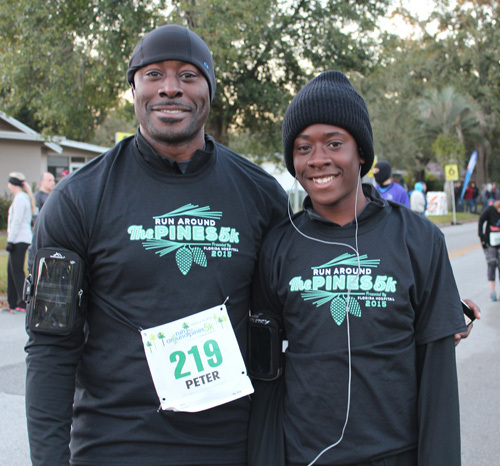 Meet Omar (son) and Peter (father) Hamilton, a running duo that we often see at local events. We asked Peter what’s next for these two. TS: You and Omar have been Fanatics in the past – what’s your running schedule look like this year? Peter: I’m considering becoming a Fanatic again. However, I have plantar fasciitis in my left foot; which has put a temporary halt to my running. I fully intend to continue running and becoming a Fanatic again, once I get rid of the plantar fasciitis! TS: What motivated you to sign up for Fanatic in the past? Peter: I have always loved running races with Omar. He and I have collected a lot of Track Shack shirts and medals over the years. Omar takes great pride in his running. He keeps all his bib numbers as well. Peter: Omar and I have been Track Shack Fanatics and we’ve ran the OUC Orlando Half Marathon, as well. Since Omar graduated from high school this year, and will be going away, he and I will most likely not be running races much in the future. However, my youngest son Malachi and I will be picking up where Omar and I left off. Activities with my sons are very enjoyable and running with them helps us have some great quality time. TS: Can you think of a favorite memory or race you ran together and why it was special? Peter: My favorite Track Shack run was the OUC half marathon. We both somewhat trained for it. Omar had never run that far before and finished well despite the distance and initial concerns he had. I had leg cramps for the last 3 miles, and was very happy to see him at the finish line smiling at me. There is no doubt that our runs have helped bring us closer and provided outstanding memories for both of us. TS: Do you have goals for the next running season? Peter: Omar and I plan to run in the Watermelon 5k. After that I will resume running on my own until Malachi is a little older. We like how running pushes us to get out of our comfort zones. God willing I have the opportunity to do a few 5k’s and a half marathon this year. Good luck to Omar as he begins the next chapter of his life. It will be even more special the next time we see Omar and Peter lining up at a start of a race. Happy Father’s Day Peter – thanks for sharing your story and your love of running with your boys!